I did not realize Mik really enjoyed the San Diego Automotive Museum when we went back in 2009 during our All the Ballparks road trip, but apparently he did. He has been asking to go every time we have been to San Diego the past six months. Finally, on our Rodeo Weekend trip we got around to going along with other San Diego museums, as we could go half price with the Museum Month deal. Mik enjoyed it, but not as much as the first time. The cars were partially different than before, which was kind of a good thing because it was some new things to see. However, Mik's favorite from last time, a Lambourgini, was one of the cars no longer there. 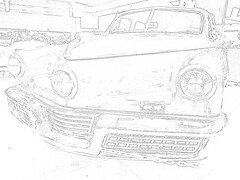 He also had fun playing with the drawing mode on his new camera. Accessibility wise it is pretty good. 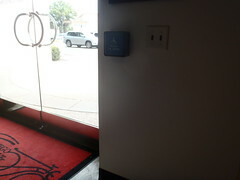 Mik loved that not only did it have buttons for opening the entrance/exit, but they easily worked. 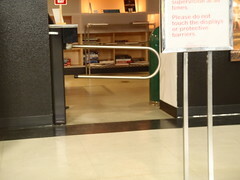 The entrance and exit to the exhibit area is turnstile like, but they are accessible metal gates that can easily be pushed forward as you roll through. It is pretty much just a giant warehouse room with cars. The cars are all spaced with plenty of room in between along with them being roped off. The motorcycle area seemed a little tight, but we really only seemed that way because someone was photographing them with a tripod when we were there.